So you wanna know about the Naked Girls, huh? 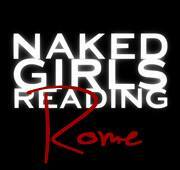 Naked Girls Reading is a group of beautiful ladies who love to read…naked. That’s really it. There’s not a whole lot more to it. Should there be? I mean, sure, they also like to do it in front all of us voyeurs via photos, videos and very special monthly events, but you don’t have to look for something larger here – something pretentious or even seedy. Once you experience it, you’ll stop asking so many questions and just let the concept take you. Naked Girls. Reading. or Girls Reading. Naked. However you need to explain it to yourself is fine. And while you do, we’ll be over here…reading. Un concetto nato e noto oltreoceano ben 60 anni orsono ed ora riscoperto dalle direttrici artistiche del Caput Mundi che offrono agli appassionati, la possibilità di rivivere quell’atmosfera ormai lontana. Born from an idea of Albadoro Gala and shot by photographer Alberto Guerri. The exhibition give way to the public to observe the curious shots (blowups of 1m to 2m) that depict the personality prominent burlesque and cabaret Roman costume … and not posed, with clothes and without: the burlesque performer Scarlett Martini, Judith Sin, Vesper Julie, Candy Rose, performers and artists Madame de Freitas and Sior Mirkaccio Dettori, musicians Brothers Urso, the stage manager and performer Blue Smoke and some students of burlesque … as well as the creator of the show itself Albadoro Gala.